A few months ago Kirsten, babysitter extraordinaire who works for Remi's family, told me about a recipe she had found online. 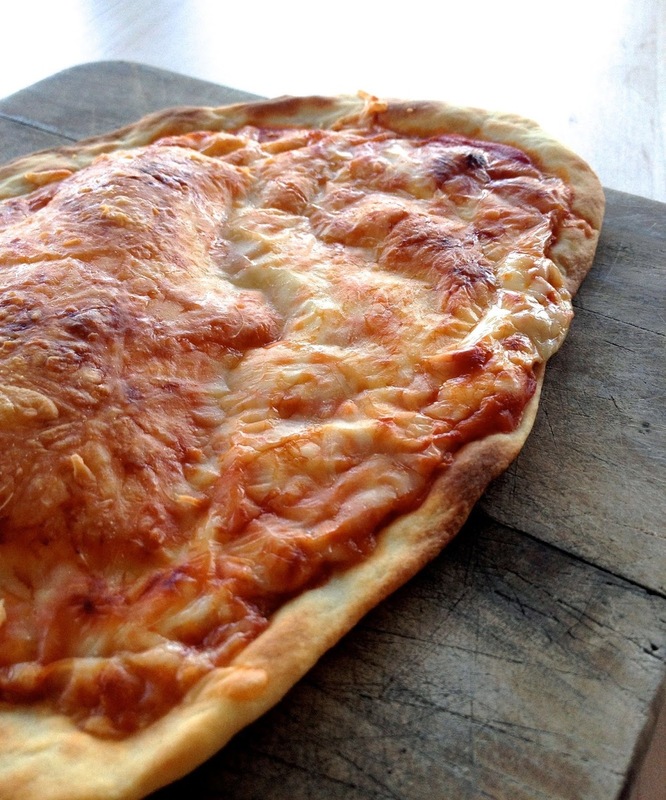 Pizza dough made from 1 cup yogurt and 1 cup flour. That's it!! I was skeptical but she swore by it. I first tried it out at my inlaws and it was a hit, even with the adults. The dough was crispy and soft and full of flavor. Since then I make it frequently, always including the kids in the process because it's so super simple and I like the idea of them learning to cook or at least appreciate cooking. But the other day when I suggested we make yogurt pizza for dinner, Nate said he wasn't interested. "Yeah Sure." His new response to everything. This actually worked much better because it was faster and not nearly as messy without the kids throwing flour all over the floor and rubbing yogurt in their hair. Mix in large bowl and then knead (I do this in the bowl to save cleanup) for 5 minutes, adding flour if needed, until it's tacky but not sticky. At this point I cheat a bit and add a few drops of olive oil to the dough, but you don't have to. Roll the dough out thin and place either on a board (if you're transferring to a hot pizza stone) or on the oiled underside of a sheet pan. Then hand it over to the kids with a bowl of tomato sauce (canned) and a bowl of shredded Mozzarella. You can put the pan right in the oven or slide the masterpiece onto your stone. Bake about 10-12 minutes until cheese is bubbly and crust is starting to brown.